That is it from me for today. 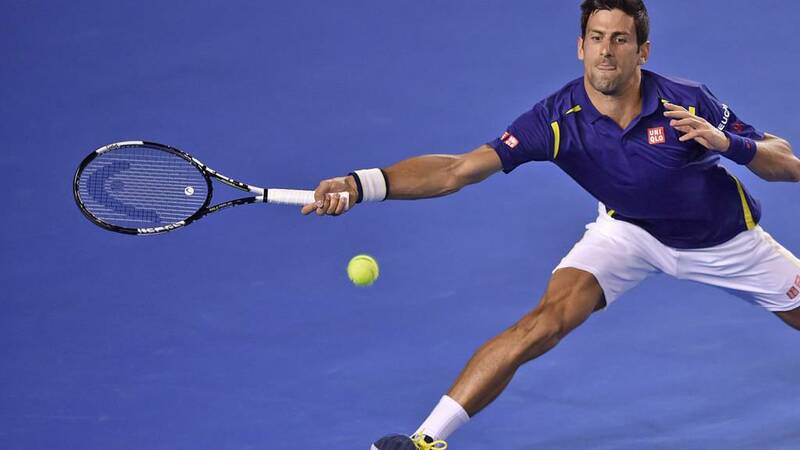 Novak Djokovic: "I have to give credit to the Australian Open. Everyone is putting effort in the development and evolution of this tournament." Daria Gavrilova, the world number 39, has done it! The young Australian has beaten Petra Kvitova, the sixth seed, 6-4 6-4 to loud acclaim, a series of whoops and a frenzy of clapping over on Margaret Court Arena. France's 19-year-old wildcard Quentin Halys gets a good ovation as he leaves the court a gallant loser. He certainly showed his potential in that third set but, in truth, was never a problem for the brilliant Novak Djokovic. The first match point is saved on Halys' serve. That is it though as Djokovic serves to the forehand and Halys nets. Another big serve from Djokovic and Haly's stabbed return is past the baseline. Djokovic is now running away with this. Match pointt. The first mini break as Quentin Halys is wide with a backhand. A first serve from the Frenchman is called in, Djokovic challenges - wrongly. The Serbian is in control as Halys goes wide. Change of ends. Brilliant from Quentin Halys as he reaches around the net post to win the first point. Djokovic levels and it stays on serve as Halys nets. Tie-break time as Djokovic takes the game to love. The line judge at one end is having a bit of a nightmare as another call goes wrong. Djokovic wins the challenge. An ace is the perfect start for Quentin Halys. Novak Djokovic is then long with a routine forehand but Halys keeps his cool and sets up game point by forcing Djokovic to the left and putting away the second ball. Djokovic thinks his forehand lands on the baseline but a challenge shows it was out. Game Halys. Can Halys break and win the set? Not this time. Djokovic puts away a forehand to make it 40-0. Halys responds with a service-return winner but Djokovic holds to 15 as the Frenchman nets. Pressure back on the 19-year-old. Sixth seed Petra Kvitova really is in danger now, having been broken in the second set. Home hope Daria Gavrilova leads 6-4 4-2 and is on the verge of a famous victory. Quentin Halys completely wrongfoots Novak Djokovic with a forehand and the Serb gestures his praise. The world number one turns the screw though as he passes with a backhand to take a 15-30 lead, but Halys stays in the game with the next point. Game point Halys after a cool sliced overhead and he holds as he booms a winning forehand down the line. A puff of the cheeks as a seventh unforced error from Novak Djokovic makes it 15-15. He quickly makes amends, forcing Halys long before setting up game point. Halys goes long and we are level. Time for Novak to break? Times tennis correspondent Barry Flatman: "Halys has grown up a bit in the last 90 minutes." Novak Djokovic is looking a tad annoyed as he sends a forehand long on the opening point of the game. An ace gives Halys a 30-0 lead before Djokovic puts a sliced lob long. Crash. A huge forehand cross court wins that game. No problems on Djokovic's serve as he wins the game to love. Quentin Halys has got himself into this match but you can't help feeling he is delaying the inevitable. Kristyna Pliskova hit 31 aces - which we believe is a record for a women's match - but ended up losing to Monica Puig in an epic second-round match on court eight. After a 62-minute final set, Puerto Rican Puig fought back to beat the Czech 4-6 7-6 (8-6) 9-7. Quentin Halys is not going away quietly. He is attacking Novak Djokovic and goes 30-0 up. The Serbian passes the Frenchman to pull a point back but Halys responds with an ace and a fist pump. That is brilliant from the world number one though, a delicate drop shot, but Halys wins the game with another big serve that Djokovic can't get back.